We meet on the 3rd Saturday of each month, except December, to help maintain the Common. Our conservation work is based on the 5-year Management plan for the Common, agreed with environmentalists, wildlife experts and the landowners, Central Bedfordshire Council. 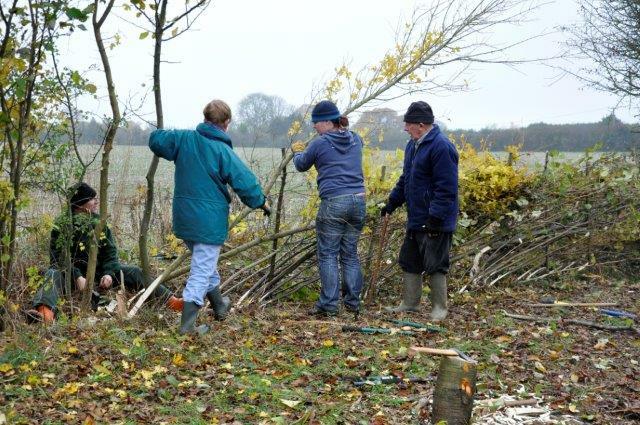 Our activities include clearing footpaths, cutting back invasive plants, restoring hedgerows, planting trees and putting up nesting boxes for bats, birds and dormice. We also have a team of volunteers who monitor our resident dormouse population during the breeding season. More recently we have added other wildlife surveys to our regular schedule. These records help us judge whether we are achieving the aims of the management plan, in respect of increasing biodiversity. It is a very sociable activity, it is good for your health and well-being and it provides lots of fun. So why not come along and make your contribution to preserving a beautiful part of the Chilterns countryside? We meet at the War Memorial at 10.00 am and work through till about 2-3pm, with a break for a fine picnic lunch, provided by our highly valued catering volunteers! But even if you only have an hour to spare you would be welcome. To help us with planning, it is helpful to know if you intend to come. However, you will still be very welcome on the morning even if you haven’t called.